Benefits of brake service include better stopping power, which allows for safer driving and an easier ride in stop-and-go driving situations such as rush hour traffic. If you regularly maintain your brakes, you can save money on more costly repairs, and you can ensure a longer life span of your brakes. At BMW of Fairfax, it is our duty to provide our customers with the best service and parts available. Find out how a brake inspection can make your car safer today! The certified professionals at BMW of Fairfax gladly work on all makes and models of vehicles. 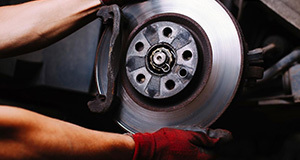 They have serviced many vehicles and regularly perform a variety of brake services. While most people understand the importance of a vehicle's brake pads, not everybody understands how they work or when they need to be changed. The way a vehicle's brakes work are by a having a brake pad clamp down between a brake shoe and a brake drum. The brake pad is the most likely part of a brake system to wear down and needs to be changed fairly often. While the time it takes a brake pad to wear down will vary from person to person, a brake pad will generally last anywhere from 30,000 to 35,000 miles. Some of the signs that a brake pad is wearing down are that your car makes squealing sounds when your use your brakes, your car has a brake light on, you hear the sound of metal on metal when you use your brakes or your brake pads are down to less than a quarter of an inch. BMW of Fairfax is known for many things, but because we use OEM (original equipment manufacturer) parts we stand out from the competition. OEM parts come from the car dealership where the vehicle was bought. OEM parts are in direct competition with aftermarket parts. Aftermarket parts are parts that are found anywhere besides a car dealership. Besides the location where the parts were purchased, there are several differences between aftermarket parts and OEM parts. One difference between aftermarket parts and OEM parts is the convenience that comes with buying your part. With aftermarket parts, finding the right part is difficult. Finding the right aftermarket part is difficult because there is such a wide variety of parts to choose from that it is tough to tell what part is right for your vehicle. Not only is it tough to tell what part is right for your vehicle, but finding a good price for that part is also a burden. With OEM parts, finding the right part and price is never an issue. Finding the right OEM part and price is never an issue because the dealership you purchased the car from will always know exactly what part is right for your vehicle and the part will have a set price. The second difference between aftermarket parts and OEM parts is that OEM parts come with warranties and many aftermarket parts don't. Because OEM parts have warranties, if something happens to your part you can go to your dealership and have your part either fixed or replaced for free. Because many aftermarket parts don't come with warranties, if anything happens to your part then your will have to pay out of pocket to have it fixed or replaced.